The MeerKAT telescope is a SKA precursor or ‘pathfinder’ telescope that will consist of 64 dish-shaped antennas designed to do ground-breaking science and will be the most powerful and sensitive radio telescope in the southern hemisphere. STRATOSAT DATACOM was contracted by the SKA (SA) to design, build and install QTY 64 x 13, 5 meter Offset Gregorian deep-space telescopes for the MeerKAT project. 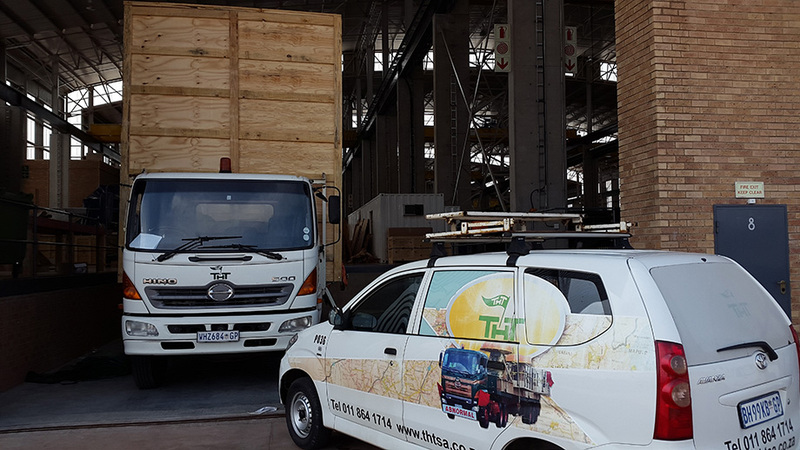 Stratosat Datacom partnered with a regional TV broadcaster to provide a full Turn-Key solution in the procurement, design and Installation of a 9.0m DBS band uplink terminal that will provide Direct-to-Home satellite TV reception from South Africa to their African client base. Stratosat successfully completed the project in the time lines specified and requested by the client..
Stratosat Datacom provided the supply, installation, and commissioning of all antenna systems for the teleport including 1×3.8 meter, 3×7.3 meter, multiple smaller antennas and all associated antenna control, RF equipment, and monitor and control system. All antennas met the performance criteria set by the satellite operators. Stratosat engineers successfully migrated 1,500 VSAT customers from the previous teleport to this new facility. Stratosat Datacom provided and commissioned a 9.2m IOT and 11m TTNT KU/DBS and C – Band full motion turning head Antenna for SANSA to use for in-Orbit Testing of Satellite Launches monitoring Satellite placed in orbit. The Antenna and all subsystems supplied were commissioned successfully and according to specification. 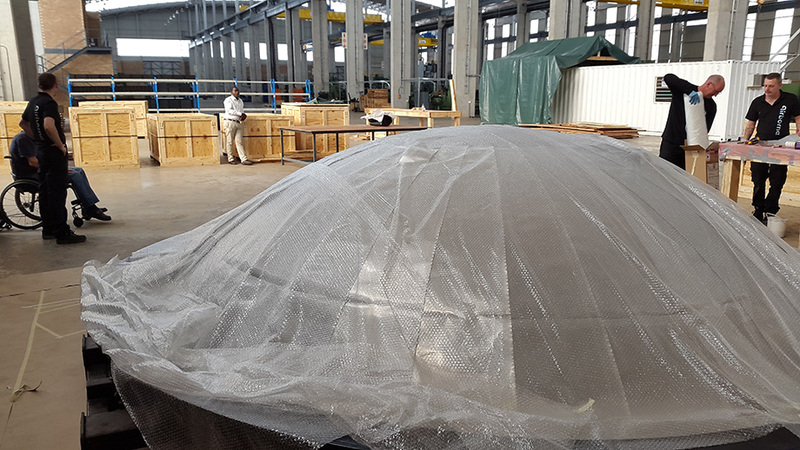 Stratosat handled all facets of the project supplying the client continues updates and project plans during the manufacturing, shipping and installation with regular client meetings to ensure all deliverables and requirements were successfully met. Stratosat Datacom provided the supply, design, installation, and commissioning of a 7.3-meter antenna, and iDirect VSAT platform as well as all facilities work (power, etc.). All systems performed according to their specifications and the network is operating as per the link budgets calculated by Stratosat. The Hartebeesthoek 26-Meter Radio Astronomy Observatory (HartRAO) is currently the only major radio astronomy observatory in Africa. It is located in a valley in the Magaliesberg hills, 50 km west of Johannesburg. The Observatory began as Deep Space Station 51, built in 1961 by the National Aeronautics and Space Administration (NASA). This Southern Hemisphere, Very Long Baseline Array Radio Telescope is a geodetic measurement instrument that networks with six VLBI programs, a telescope combining technique that forms the equivalent of one large telescope with a diameter equal to that of the earth. It was rendered motionless when its Southern bearing failed in this Hour Angle – Declination style radio telescope. This did considerable harm to the ongoing VLBI array studies, and generated significant pleas from the cooperative scientific organizations to repair the telescope or build a new one. In all, the instrument was out of service for about two years. 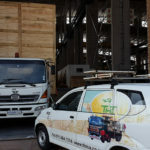 Several regional companies were afraid to accept the repair without long costly studies with no guarantee that they would accept the repair even then. Stratosat worked with General Dynamics SATCOM Technologies to identify the design and approach for the project. 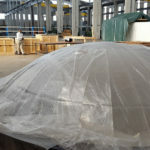 Stratosat then performed as the South African Program Manager to get the steel fabricated locally and prepare the site for the repair. The engineered lift design transferred 400,000 lb. structure load from the damaged bearing safely and securely to a new support frame. The bearing was replaced and the main antenna restructure refitted. Job finished on schedule and in budget. 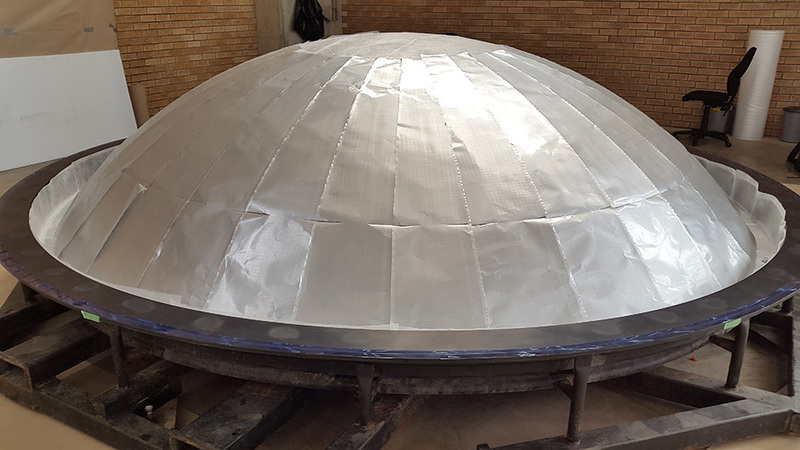 Following this successful project, STRATOSAT DATACOM is also undertaking further work for NRF including the analysis of a 32-meter C band ex-telecom antenna in Ghana for possible conversion to a radio-astronomy telescope. NRF have recognized STRATOSAT DATACOM as the leaders in the field of conversion of telecommunications antennas to scientific instruments. 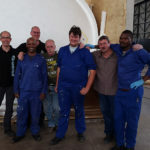 Stratosat Datacom (Pty) Ltd celebrated the inauguration of its Sub-reflector Manufacturing Facility on the 23 April 2015 in Elandsfontein together with SKA (SA), the Department of Science and Technology, General Dynamics SATCOM Technologies, Airborne International and various South African suppliers. 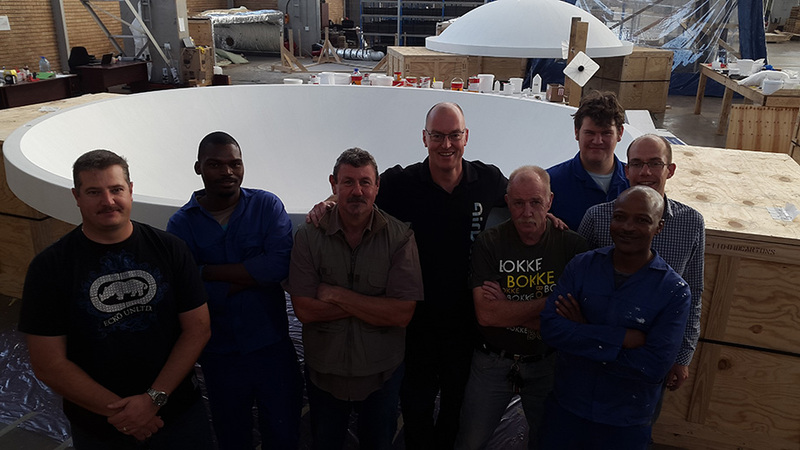 Stratosat Datacom (Pty) Ltd as part of the Schauenburg International Group won the tender issued by SKA (SA) in 2012 to design, build and install 64, 13.5 meter Offset Gregorian deep-space telescopes for the MeerKAT project. Stratosat Datacom teamed up with General Dynamics SATCOM Technologies, global leader in the design and building of advanced radio telescope antennas, to install the MeerKAT radio telescope antennas. For this purpose Stratosat Datacom opened up a Panel Manufacturing Facility in Kempton Park in November 2014. 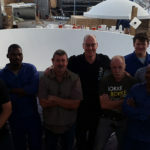 The first 4 antennas were completed at the SKA site near Carnarvon in the Northern Cape at the end of March 2015 which was a major milestone. 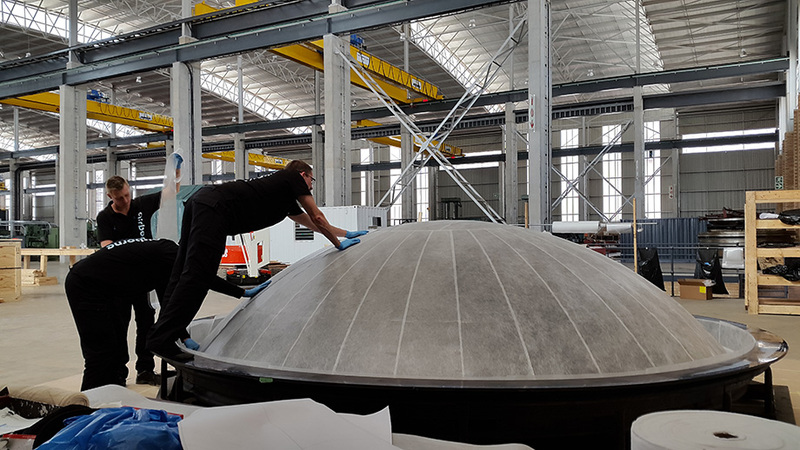 For the purpose of manufacturing the sub-reflectors based on composites, Stratosat has additionally partnered with Airborne International, a Dutch company, which is the market leader in highly specialized composite structures. 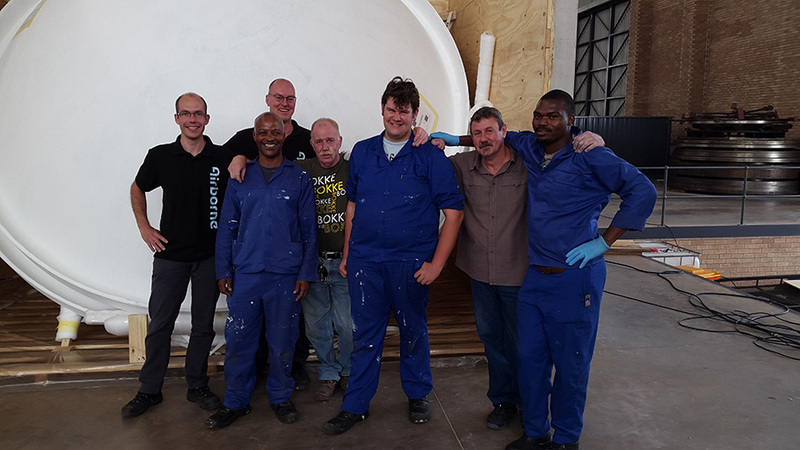 On the 6 February 2015 the first shipment of material, from General Dynamics SATCOM Technologies in the United States, arrived on site in Elandsfontein, where Stratosat Datacom together with the team from Airborne International started the production of the composite Sub-reflectors at the TSR-building in Elandsfontein. “Based on one of its fundamental business-principles of Growing in Partnerships, the Schauenburg Group is committed to foster its foothold in South Africa through technology transfer and creating local job opportunities. I am really proud of what we have accomplished so far in cooperation with domestic and foreign suppliers”, says Florian Schauenburg, CEO of Schauenburg International Group. 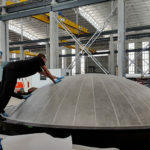 The project, which forms part of the greater SKA project, required that at least 75% of the components be manufactured locally and as a result these two manufacturing sites were established by Stratosat over the last 12 months. Part of the agreement in building these antennas in South Africa is to transfer skills and knowledge to South Africans. “In order to further promote education and training in the country we have recently established an Education Trust to provide bursaries to young black students and we have joined the German Chamber’s C.A.T.S program, which is based on integrated learning covering theoretical studies with practical experience in the work place”, states Dieter Kovar, Managing Director at Stratosat Datacom. It is Stratosat Datacom’s vision that this facility will serve as a technology hub for the telecommunications industry to promote the further development of radio astronomy research by bringing new technology and skills into the country. 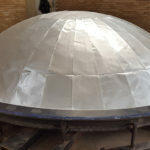 The long-term intention is to manufacture panels based on different technologies such as aluminium and composites according to customer needs.